U.S. #1285 from the Prominent Americans series. On July 16, 1945, members of America’s Manhattan Project held their first successful test of the atom bomb in Alamogordo, New Mexico. The Manhattan Project’s (named for the city where the research began) roots stretch back to 1939, when it was revealed that German physicists had discovered how to split uranium atoms. Albert Einstein and Enrico Fermi were scientists who’d escaped to America from Germany and Italy respectively. Einstein sent President Roosevelt a letter urging him to develop an atomic research program. Roosevelt didn’t think the project was necessary, but agreed to proceed slowly. By late 1942, the Manhattan Project, America’s program to design and build an atomic bomb, was established. 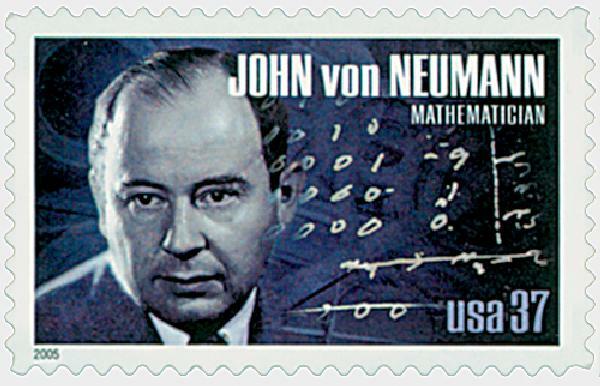 U.S. #3908 – John von Neumann worked on the implosion design for the bomb. The research began at just a few universities. The first major breakthrough came in December 1942 when Fermi and a group of physicists created the first controlled nuclear chain reaction. This development led to vastly increased funds and the creation of several nuclear facilities. The main plant was located in Los Alamos, New Mexico, under the leadership of Robert Oppenheimer. In the summer of 1945, he was ready to test the first bomb. In the early hours of July 16, 1945, the project’s scientists and a few dignitaries convened on Alamogordo, New Mexico, about 120 miles south of Santa Fe. They positioned themselves about 10,000 yards away from the bombing site. The bomb was dropped at 5:29:45 a.m. The resulting blast was visible for 200 miles. It produced a mushroom cloud 40,000 feet high and blew out windows in civilian homes up to 100 miles away. The blast also created a half-mile-wide crater and transformed the sand below into glass. A cover-up story was released, claiming that a large ammunition dump had exploded in the desert. 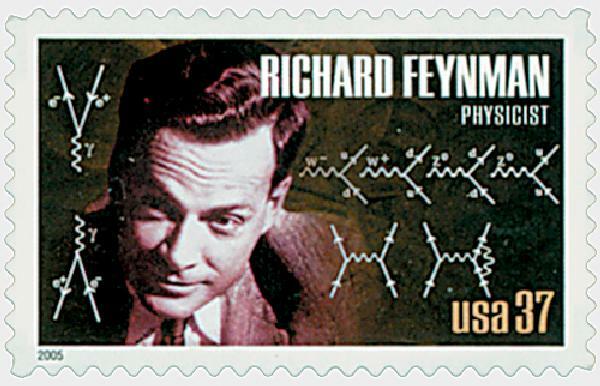 U.S. #3909 – Richard Feynman worked on the project and claimed to be the only person to watch the test bombing without dark glasses. The project, which had an initial budget of $6,000 ultimately cost about $2 billion and employed over 120,000 Americans. The success of that test ushered in the atomic age and now American leaders pondered where to use their new bomb. Germany was the original target, but since they had since surrendered, Japan was selected. U.S. #2981h – From the 1995 World War II sheet. President Truman, who was at the Potsdam Conference in Germany, was informed the test was successful. The next month, bombs were transported from the U.S. to the Mariana Islands in the Pacific while specially adapted B-29s flew there. 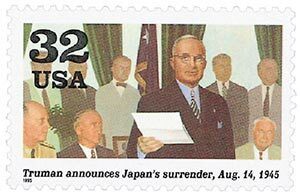 The U.S., Great Britain, and China issued an ultimatum to Japan – surrender unconditionally or be destroyed. Unfortunately the Japanese chose to fight on. On August 6, a B-29 named Enola Gay dropped a uranium bomb called “Little Boy” on Hiroshima, Japan. Between 70,000 and 100,000 people were killed in the blast. Three days later, a bomb using plutonium exploded over Nagasaki, killing 39,000 people instantly. Japan surrendered shortly afterwards on August 14. Historians from both countries agree that the atomic bombs actually saved American and Japanese lives. With the war concluded, America’s top scientists and leaders knew that nuclear weapons and energy would have a tremendous impact on the future. Connecticut Senator Brien McMahon (1903-1952) served as chairman of the Joint Committee on Atomic Energy. 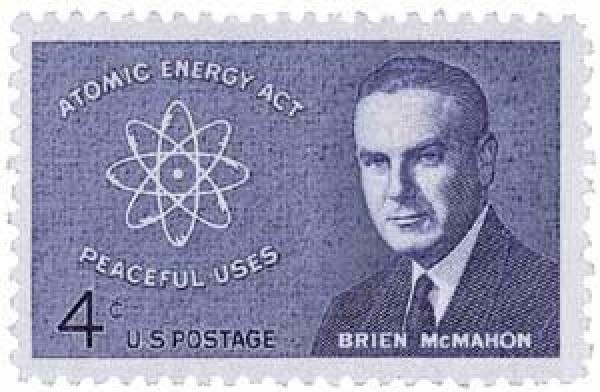 McMahon also authored the McMahon Act for the control of atomic energy, which resulted in the establishment of the Atomic Energy Commission (AEC) in 1946. The AEC directed the development and use of atomic energy for both military and civilian purposes. U.S. #1200 was issued on the 10-year anniversary of McMahon’s death. In December 1950, President Harry S. Truman established the Nevada Test Site (NTS), a gigantic outdoor laboratory, about 60 miles northwest of Las Vegas. At approximately 1,375 square miles, it’s larger than the State of Rhode Island. The site was the only nuclear weapons testing area in the continental U.S. Before 1950, most nuclear tests had been done at small islands in the Pacific Ocean, which was very costly and time consuming. The first bomb tested at the NTS was a one-kiloton warhead, detonated January 27, 1951. Nuclear tests continued at the NTS for four decades. On December 8, 1953, President Dwight D. Eisenhower gave a speech before the United Nations General Assembly. 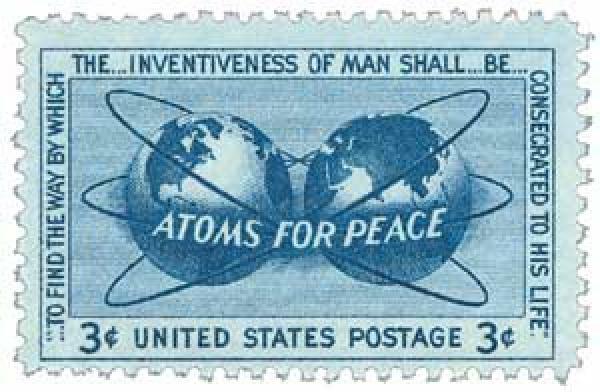 President Eisenhower stated that he hoped “to find the way by which the inventiveness of man shall be consecrated to his life.” He proposed a program called Atoms for Peace, in which nations would donate atomic power to the United Nations, in order to find peaceful uses for it. This program developed into the International Atomic Energy Agency, and had far-reaching effects on American policy and attitudes. In 1962, under the control of the Department of Energy (DOE), the NTS was also used to develop peaceful uses for nuclear energy. Since the 1992 moratorium on nuclear testing, the Department of Energy has used the site to test hazardous chemical spills, emergency response training, conventional weapons testing, waste management, and environmental technology. This entry was posted in July 2016, This Day in History. Bookmark the permalink. 15 Responses to "This Day in History… July 16, 1945"
Should this not read 1950? Earlier tests had been conducted at Nevada Test Site (NTS) however, the it became aware to the public in 1960. Most likely because the scientists and dignitaries responsible for the tests wanted to gather information regarding the projects. On August 6, 1945, I traveled with my sister and brother-in-law from Espanola, NM to Tres Piedras NM to my parents home. As we pulled up to the house, Dad came rushing out to announce that the bomb had been dropped. He had been working as a carpenter at Los Alamos on a secret project building a vault which had housed the bombs. Of course, he didn’t know what the vault was for. My brother-in-law, a US Army Air Corps 1st Lt, was on leave before reporting to Florida to train for the B-29. He had been flying missions over Germany in a B-17. At the news, realized that his life and many others had this been spared. A few days later, Japan surrendered and WWII was over. Another good historical sketch of something very important that took place in the lifetime of many of us. I believe this reference should be December 1950, not December 1960…good article though: In December 1960, President Harry S. Truman established the Nevada Test Site (NTS), a gigantic outdoor laboratory, about 60 miles northwest of Las Vegas. It was 1950, not 1960, that Truman established the NTS. My Grandfather was driving from Hobbs, NM to Carlsbad, NM where he was an electrician in the potash mines, and he saw the light from the blast. The bomb was denoted from a tower, not dropped. When I was young I interned for a summer at Los Alamos, studying all the various facets of the technology and history of the place, people and events there. One of the more interesting stories I was told by someone who was there with Oppenheimer was that they really didn’t know what would happen when they fired off the first bomb in New Mexico. The belief was that it could simply fizzle and go “pop” and do little else, that was the reason for the containment shell (which was to hold the precious plutonium should that happen). Oppenheimer believed that the bomb would go off, and would be spectacular, however others there had grave misgivings. The third possibilty to which they thought could happen was that the explosion would not be contained and that it would explode the atmostphere and burn the planet to a crisp. Even Oppenheimer was concerned as to this possiblity, but opted to test it anyway. So it would seem that while Einstein’s God would not play dice with the universe, Oppenheimer would, at leat this small peice of the universe. My aunt was a secretary for Enrico Fermi during the war and had the pleasure of serving tea for Einstein during one of his visits. None in our family had an inkling, of course, what was going on. She was quite mum about her position and duties. One wonders if secrets like the Manhatten Project would be possible in this day and age of gratuitous social media? The first nuclear explosion was not a “bomb”. It was a nuclear “device”. It was not “dropped” (as in “dropping a bomb”). It was a stationary device, placed on top of a metal framework tower – just to be accurate. So many of the people working at Los Alamos died of cancer in their 30’s,40’s and later- mostly thyroid, or suffered greatly later. There’s pretty good proof that 300 of the 400 cast members of John Wayne’s “Barbarians”died from the dust blown across the desert after the first “test”. WE nuked ourselves 280 times- more than the Russians could ever dream of. Question?- what happened to all that fallout? I think everybody realizes we contaminated our whole country with amazing increases in cancer. One of the scientists involved in the Manhattan Project was an Australian, Mark Oliphant (later Sir Mark) who said he was proud the bomb worked, but appalled at what it could do to humans. He became fervently anti-nuclear. And also Govenor of South Australia. 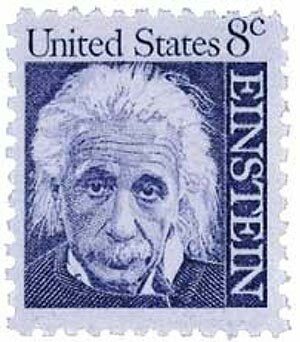 http://www.linns.com/news/world-stamps-postal-history/2016/july/isle-of-man-stamps-albert-einstein-stephen-hawking.html I bought the prestige booklet of stamps from Isle of Man Post Office Store Online on 7/1/2016.